After the revolution, Jefferson spent a number of years in France before becoming President. In this time, he amassed an amazing culinary collection that would influence his dinner table for the rest of his life. One of the dishes he enthused about was ice cream; not only did he buy an ice cream maker while abroad, but the Library of Congress also holds the vanilla ice cream recipes that Jefferson jotted down in his own hand. mix the yolks & sugar. put the cream on a fire in a casserole, first putting in a stick of Vanilla. when near boiling take it off & pour it gently into the mixture of eggs & sugar. stir it well. put it on the fire again stirring it thoroughly with a spoon to prevent it’s sticking to the casserole. when near boiling take it off and strain it thro’ a towel. put it in the Sabottiere then set it in ice an hour before it is to be served. put into the ice a handful of salt. put salt on the coverlid of the Sabotiere & cover the whole with ice. leave it still half a quarter of an hour. then turn the Sabottiere in the ice 10 minutes open it to loosen with a spatula the ice from the inner sides of the Sabotiere. shut it & replace it in the ice open it from time to time to detach the ice from the sides when well taken (prise) stir it well with the Spatula. put it in moulds, justling it well down on the knee. then put the mould into the same bucket of ice. leave it there to the moment of serving it. to withdraw it, immerse the mould in warm water, turning it well till it will come out & turn it into a plate. Below, an adaption of this recipe for the modern kitchen. And if you’ve always wanted to know how to make ice cream from scratch, sign up for my class at the Brooklyn Brainery a week from today, on Sunday, September 4th. I’ll go through the process step by step and talk about the origins and science of ice cream making. See you there! 1. In a glass bowl, whisk together egg yolks, sugar and salt until blended. 2. Add split and scraped vanilla bean to 1 quart of cream; bring to a boil, then pour slowly into the egg mixture, whisking constantly. 3. Cook egg and cream mixture over a double boiler, stirring constantly with a wooden spoon, until custard thickens slightly and evenly coats back of spoon (it should hold a line drawn by your finger). Pour custard through a fine-mesh sieve into a bowl set over ice, or place in refrigerator, until chilled. 4. Churn in an ice-cream maker according to manufacturer’s instructions, adding mix-ins like nuts or fruits in the last few minutes. Transfer ice cream to a resealable plastic container and freeze until firm, about 2 hours. 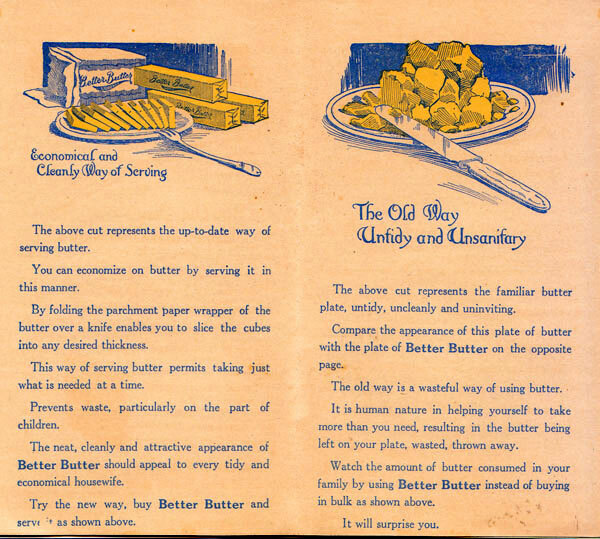 Take a moment to read the above advertisement for “Better Butter,” c 1914. I’m becoming convinced that the terms “Hygienic” and “Sanitary” were the “All-Natural” and “Organic” of the 19teens: buzzwords that not only reflected the culture of a time, but were also important tools for advertising. In a way, it’s not a surprise. For decades children had died of swill milk; germ theory was slowly being accepted by the turn of the century; and, without antibiotics, there was still not a cure for most contagious illnesses. There was a focus on the best preventative medicine: good hygiene. The shift from stuff made at home = bad and stuff from a factory = economic, sanitary, attractive, appetizing is interesting to think about. I understand why it happened: to be able to buy a gallon of milk, a pat of butter, or a loaf of bread in the grocery store that is clean and consistent is a beautiful thing. But, I think society’s shift back to a love of the homemade has provided a much needed balance. 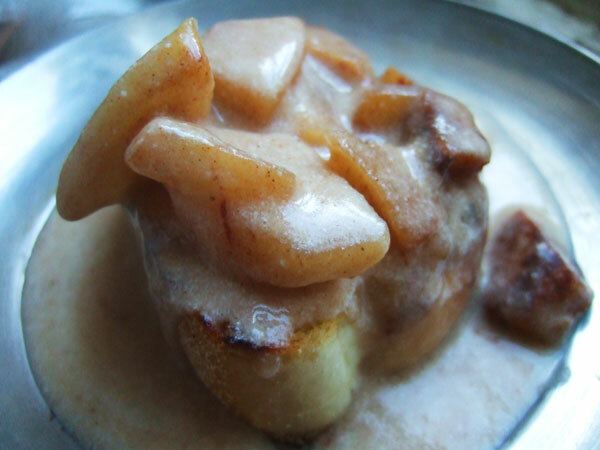 Baked pears, thickened buttermilk, and fried bread. On Sunday, I appeared on the Heritage Radio Network, chatting with Carmen Devito & Alice Marcus Krieg of We Dig Plants. We talked all about PEARS! If you haven’t heard the show yet, go here and listen for free. I dug up some pear recipes from the annals of history with the idea that we would pick one to try. Well, we had a difficult time agreeing, so this week I’m going to cook up three very different 19th century pear recipes. I needed some buttermilk education, so I naturally turned to that font of knowledge, Wikipedia. I knew buttermilk as the bi-product of butter making: when cream is churned, the result is a solid (butter) and a liquid (buttermilk). I knew that before seperation, fresh milk was often set in a cellar to seperate into milk and cream; what I didn’t realize is that this milk would also ferment because of naturally occuring bacteria. This fermentation is what gives buttermilk its sour taste, although in modern production facilities we artificially inseminate pastuerized milk with a squirt of lactic acid bacteria. Although the recipe doesn’t explicitly say to make a roux, I think it implies it. 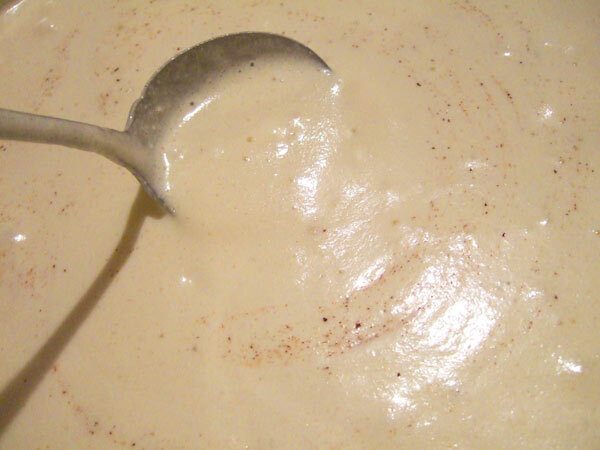 The roux will thicken the buttermilk. 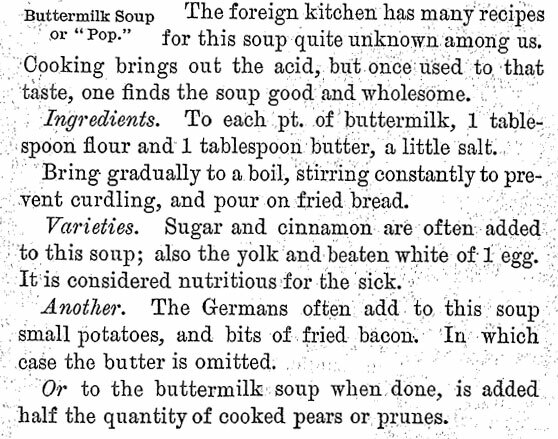 From Practical Sanitary and Economic Cooking by Mary Hinman Abel, 1890. 1. Preheat oven to 350 degrees. Pare, core, and dice pears, then arrange in a baking tray (cake pan, etc). Sprinkle with sugar and spice. Bake for 35-45 minutes, or until tender. 2. In a large saucepan over a medium-low heat, heat 1 tablespoon of butter and the flour to make a roux. Cook until flour begins to brown. Add buttermilk and salt, turn heat to medium-high. Bring to a boil while stirring constantly, then turn heat off. Add baked pears to buttermilk mix, stir to combine. 3. Melt remaining butter in a small skillet and fry two slices of bread. Remove to a plate and top with pear/buttermilk mixture. The original author of the recipe warns that cooking buttermilk “brings out the acid,” but I found the taste of the finished product to be surprisingly mild, either as a result of being cut by the fat of the butter or the sweetness of the pears. And frankly, I was skeptical of this recipe, and it was not my first pick to make. But I was delightfully wrong: this is the perfect snack. It’s like a delicious warm yogurt treat (tastes better than it sounds): the dairy was filling, the pears sweet, and when poured over hot, buttery bread, it’s just the right amount of food. Highly recommended, four stars, etc. etc. Try it. On a completely unrelated note, I wrote this post jamming to my friend Gregg Gillis’ (Girl Talk) new album All Day, available for download for FREE. It is really, REALLY good. 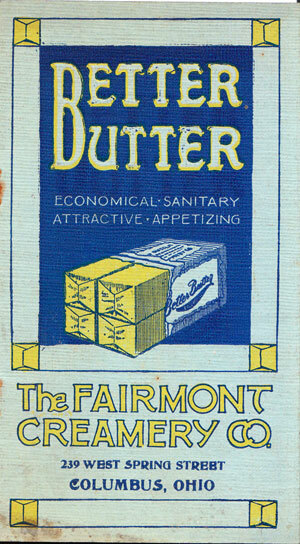 In the News: Bring Back Butter! Through my experiments in historic gastronomy, I have come to appreciate the beauties of butter, particularly when it’s fresh from the churn. “About a year ago I was thumbing through a 1905 Sears catalog I found in a used book store. It was humorous to see how everything was so bulky and strange looking and only performed simple tasks. It occurred to me that in 100 years our machines will look silly and inefficient. If you’d like to support Eads in his butter dreams, then stop by his Kickstarter page, where he’s raising funds to make the butter bike a reality. I wish him all the best. And on a similar note, a novel gift idea: handmade butter, presented in a decked-out mason jar. Visit slowchristmas.org for the recipe.